Hello my crafty friends. 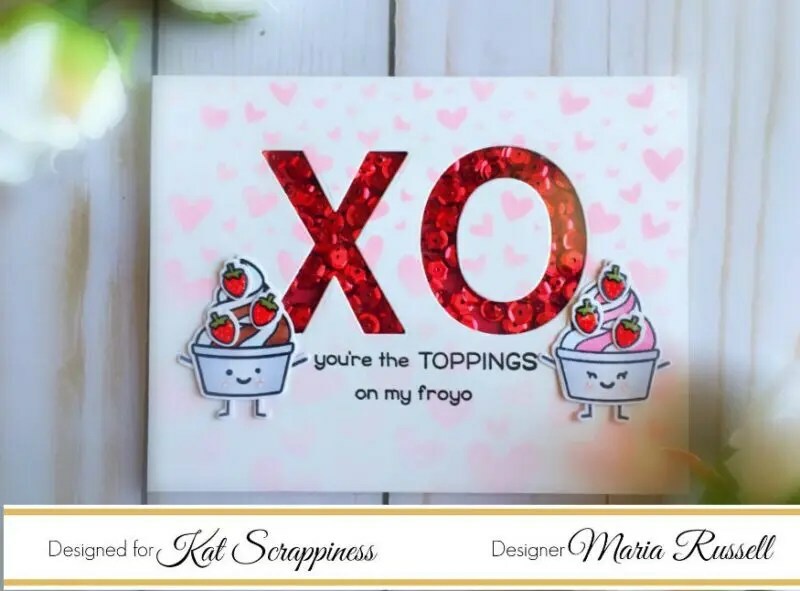 I am back today to share with you a simple Valentine’s Day card, showcasing the new Large Alphabet dies and Christmas Red Sequins by Kat Scrappiness, Lawn Fawn Sweet Friends stamp set and Lawn Fawn Sweet Friends coordinating dies, plus other supplies available at the shop. I started out by stamping my images on Neenah Solar white card stock and I colored the images in with my Copic markers. I cut another 4 1/4 x 5 1/2 piece of Bristol Smooth white card stock and used my Tumbling Hearts stencil to create my background, with my Worn Lipstick distress oxide ink and the ink blending tool. I wanted to create a Valentine’s Day shaker card and also use the new Large Alphabet Dies. I chose the letters, X and O and used my die-cutting machine to cut my background. I covered it with my acetate and used my foam tape to create my shaker window. I have been meaning to use the Christmas Red sequins and thought that this was the perfect color to use as my shaker element. Isn’t this adorable? I hope you like my card today and got inspired. Please visit www.katscrappiness.com for inexpensive dies and craft supplies. Don’t forget to use my coupon code “MARIA10” for 10% off your order at the shop. The supplies I used are listed and linked below. Have an amazing day!